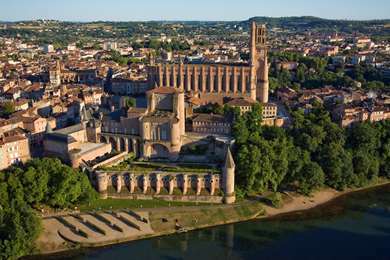 Albi is one of the main cities built in the Languedoc red-brick style, along with Montauban and Toulouse. Visit the Sainte Cécile cathedral, a half-hour walk from the Kyriad Hotel Albi and admire the building on your way. Nearby, you will find the Toulouse-Lautrec museum, located in the Bishop’s Palace, a building which is older than the Palais des Papes in Avignon. Albi’s Pont Vieux (Old Bridge), originally built in stone in 1035, is still in use after almost a millennium and is well worth seeing while you are there. About 40 minutes on foot from the Kyriad Hotel Albi is the Musée de la Mode, which only opened in 2012, displaying a collection of the finest clothing dating back to the 18th century up until the 1970s. Also, take a stroll along the river to relax. The Musée Laperouse, about half an hour's walk from the Kyriad Hotel Albi, tells the tale of a sailor from Albi, who disappeared on an expedition to Australia, which is bound to fascinate children and adults alike. Between mid-June and mid-September you can take a half-hour boat ride from just north of the Toulouse-Lautrec Museum in a flat-bottomed barge for an alternative way of seeing Albi. Albi’s bus station and main train station are linked by the number 1 bus, but ask at the tourist information centre for a timetable. Albi is served by two train stations, Gare d’Albi-Ville and Gare d’Albi-Madeleine. The A68 motorway connects Albi with Toulouse. The food in the Mid-Pyrenees Region is a balance between French and Spanish cuisine. Generally the food is hearty and based on local produce. The area blends southern France’s country casseroles with spicy Spanish cooking. Expect duck, goose and chicken and lots of cheese, as well as fresh truffles and walnut oil. At the end of February towards the start of March, Albi hosts a carnival that has been going since 1905 and features huge floats. Throughout June and July there is a host of musical events as well as a theatre festival. In fact, there are intriguing events most months in Albi, ranging from large bric-a-brac fairs to a Grand Prix in September. Henri de Toulouse-Lautrec, considered one of the most important Post-Impressionist painters and art nouveau illustrators, was born in Albi. His parents were cousins, and his two grandmothers sisters, and it was claimed that this was the cause of his health problems – as a teenager he broke both of his thigh bones, which did not grow back.